Arizona Beer Week 2019 is underway! On Day 1 (Thursday, February 7th) I was able to take in two events. 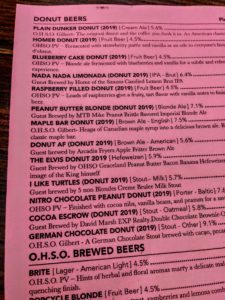 For the third year in a row, I started Arizona Beer Week at OHSO Paradise Valley, taking in Donut Day. 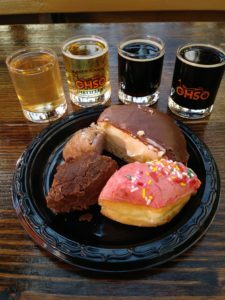 Every year, OHSO brews specialty beers and pairs them with donut samples. It seems like an odd combination, given donuts' sugar level, but OHSO has the delicate art of brewing beer for donuts down pat. This year, I opted for two lighter styles along with two darker styles. I chose the Homer, Blueberry Cake, I Like Turtles, and German Chocolate. The Homer and Blueberry Cake were paired with fruit beers, which lean sour (and I generally hate them), but this pairing seemed to be transformative, lessening the sour factor. The Turtles and German Chocolate beers were both good, but the German Chocolate was my favorite of the day. After donuts at OHSO, I headed to Hopdoddy on Camelback for a Mother Road 'take-over.' 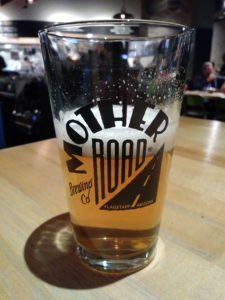 Mother Road was on hand, pouring Tower Station, their Kolsch, and their Lost Highway Black IPA. I was among the first to arrive, so I scored a Mother Road beer glass. Sadly, they were not pouring their hazy IPA, which they had announced they would be serving. Still, I had a great time chatting up beer ambassador Gabe.